A unique approach to the classic game of chess. this is a chess like strategy game. 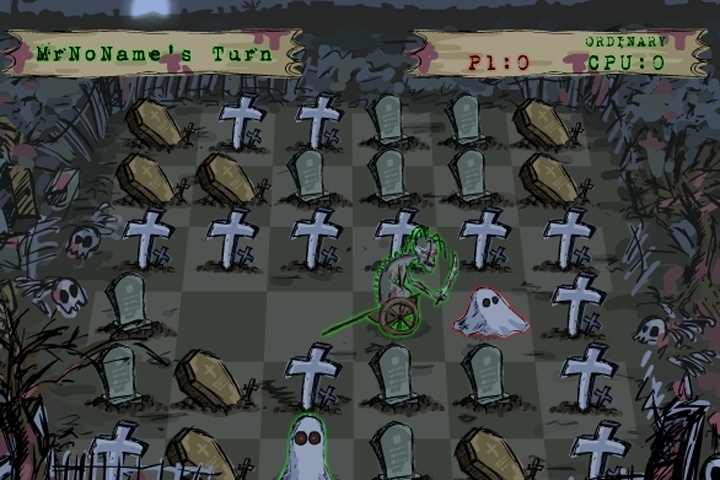 Your objective is to clear the board (graveyard) of your opponent's pieces (ghouls). Unlike regular chess, you do not see a playing piece until it rises from the grave and you do not know if it will be on your side or the opponent's until it actually appears. Each 'chess' piece is allocated a strength value from 1 to 6. In general, a higher-ranked ghoul can kill another ghoul of equal or lesser strength. However,this does not apply to the pawn - the pawn can kill the king, but the king cannot kill the pawn. If you want to play Tomb Chess games online you have come to the right place! GamesLoon adds new Tomb Chess games every week. This is your game portal where you can find the biggest collection of free Tomb Chess games online. Do not forget to rate our Tomb Chess free online games while playing!